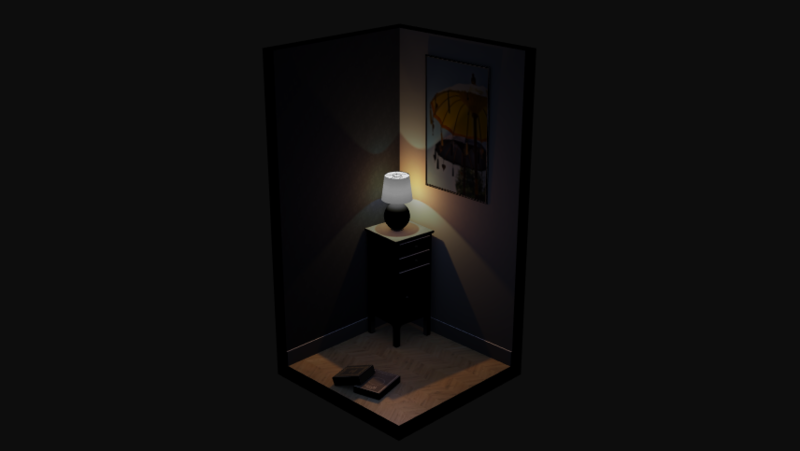 This article will use the excuse of a tiny scene to explain a simple workflow from Blender to BabylonJS, using lightmaps so as to tend to realistic lighting. 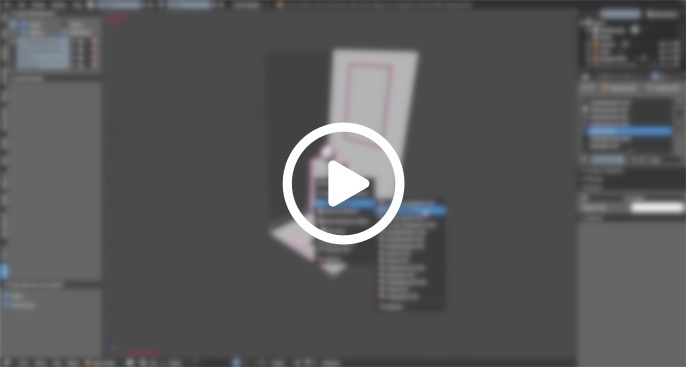 Non-Blender guys should be still interested by this tutorial, as modeling, unwrapping and organisation guidelines keeps the same in any modeler, and of course the BabylonJS (aka BJS) side is totally independant of the modeler used. You should of course took a look on BabylonJS Babylon 101 and How to... pages. In this example I'm not using PBR workflow but Standard one. This come from the fact that the official Blender-to-BabylonJS exporter doesn't yet handle PBR material exporting. Plus knowing how to work with Standard workflow still could be useful if we target no-so-high-end user hardware (not everybody have the lastest smartphone). Note that you can export as PBR using glTF format, this workflow is still experimental but usable, this may be a subject for a next tutorial. BabylonJS devs give us an editor, but for now it have some limitations for a daily use, specificaly the fact that I can't export and reexport my .babylon/.gltf scene file without loosing my editor tweakings. It can be useful on small one-shot scenes, but in production mode you always have to tweak your scene between your modeler and your engine. But keep an eye on this editor, it's often updated. We work on a realtime project, so keep attention to naming to later make easier the code manipulation. Objects are put in layers to make our life better. Nothing unusual here. 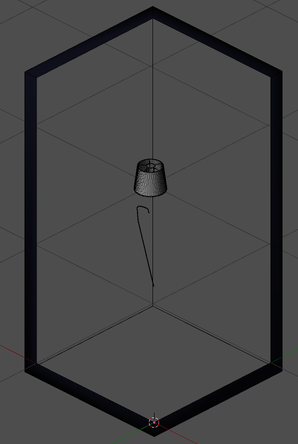 Try to setup your seams and sharp edges when a mesh is done, to avoid have to come back on it later. Do not waste time on UV2 for now, we just have to check if the automatic unwrapping behave good (Unwrap or SmartUnwrap). UV1 can be definitive. We have also the option to keep objects detached and to share UV2, but this make both Blender & BabylonJS workflow complicated. At this stage it's already possible to make a first export to BabylonJS, even if our lightmaps still doesn't exists. You can read official doc' about exporter (I wrote some piece of words in it, do not hesitate expressing feedbacks on it). If you don't already have BabylonJS scene prefab' on hand, don't forget the existence of the editor, or also the sandbox, which allow you to see your 3D in all angles in no time. Export process isn't really complicated. As you've seen in the official doc', adjustments are in properties panel (for mesh, world, materials, etc). When our realtime scene is ready, it's time to see the light. The focus here will be on lighting and not on materials. Actually, we're going to overwrite most of our materials with a very basic and simple one. 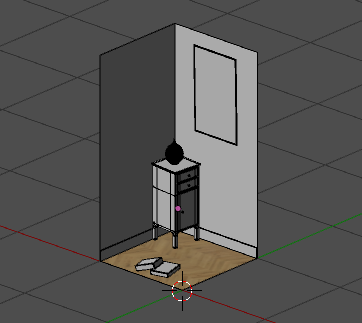 First step in our new empty Cycles scene is obviously to append our objects in it. In case you're updating the Cycles scene, you already have old objects versions. Before importing new ones, delete the oldest and don't forget to purge Orphan Data through the Outliner. 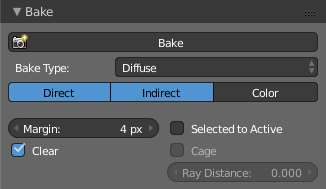 Since for baking we only need light impact, we don't have to convert all our Blender Render materials to Cycles ones. On a tiny scene like this one, it's still conceivable but on a huge scene containing hundreds of materials there's enough to pull your hairs out - especially if you have to update your geometry three days later. To avoid loose it during an Orphan Data cleaning, we set it as Fake User. Yep, but what about the color bleeding? Indeed, we lose it completely with this technique. So we can target strategic elements and apply to them specific materials. In this example scene, I've choose the wooden floor ; but this material is still very simple, consisting of the diffuse texture simply linked to the Diffuse BSDF shader. 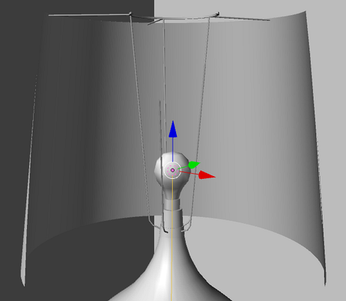 However, by placing the light in its logical place (in the middle of the light bulb), an issue comes: light doesn't travel through bulb and lampshade. We now have a nice lighting, time to go to the lightmaps baking step! I use the Baketool addon, easy to use. You will find some other addOns at the end of this page. If you need default Blender baking workflow, check the official doc'. Get your objects list and bake on the second UV channel. 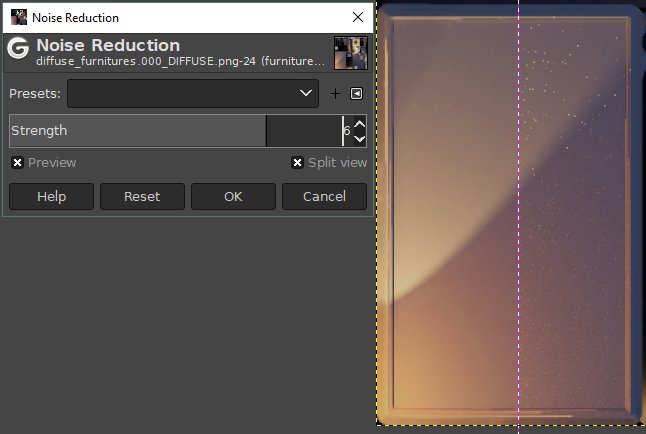 The main point here is to bake the Diffuse pass without the Color option. Indeed, we just need direct and indirect lighting, nothing more. Save your lightmaps files on BJS/assets/lightmaps/ folder. As seen above, you may don't bother yourself with code, by using the official editor. 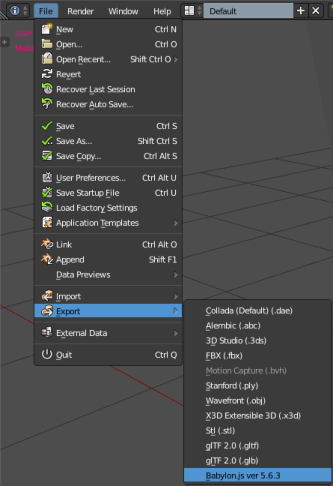 Just be sure to not have to reexport and so reimport your scene file. Note that you need a web server. You will find some tips here. But this tutorial will start from scratch. Nevertheless, if you're not comfortable with coding, copy-paste way is often possible. Note that I'm not a developper so my code is probably not optimal. Prefer using your browser in private mode to avoid cache issues, and always show the console (you can even setup your console to always disable cache when opened). You can already export the babylon file in the assets folder, textures will be copied automatically. Put your lightmaps files in their folder. index.html is the place where everything will happens. Start to create an empty file named as index.html, then edit it. In the <head> tag, nothing unusual: we tell where is the BabylonJS engine file, and we tell the browser that we want our 3D part (canvas) takes all the whole page. Here our first scene loading! Before taking care of materials, we still have to handle lightmaps and assign them automatically to our objects. If you just want doing copy-paste without analysis, check only this part: var lightmappedMeshes = ["wallz.000", "furnitures.000"]; where you have to customize your lightmapped objects name. Of course in a huge scene using tons of objects you can't manually set a list like that, but for this tutorial, automate this process would have been overcomplicated. We quickly see something is wrong in our render. When we have setup the useLightmapAsShadowmap property in our lightmapped materials, we tell engine to multiply scene ambientColor with materials ambientColor. So if the scene ambient is gray, even if a material ambient is white, this will make it gray (clamped by scene ambient). Same as for materials, the more you set in Blender, the easiest it is. For more advanced tuning, you should understand how to do that once tut materials part done. To know all existing properties names, as usual... check the doc'. Don't forget settings which are already reachable through Blender. let's say we want our white wall turned to pink. We just have to go on the Material tab, find our material (use the Filter by name...), find our ambientColor property and tweak it. Then your reload your page to check if it's saved... and here the drama: of course, our tweak is lost. You're going to tell me "Hmm ok, but ambientColor could be set up without any difficulty inside Blender, isn't it? ", and you'll be right, this example was just an easy-to-see one for this tut. The process is exactly the same for any property, here I just checked the API about ambientColor and I can see BJS ask for a Color3, duly noted. 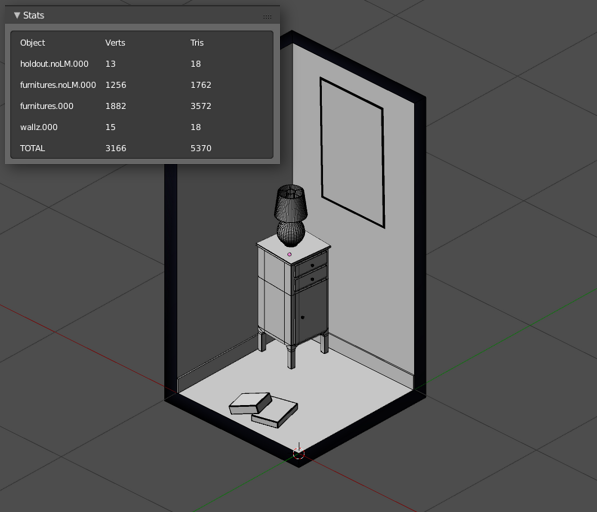 Let's imagine that I want to delete a lightmap on a specific material, and not on all the object? My normalMaps have been created for DirectX and not OpenGL? 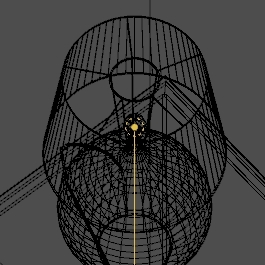 Then inside Blender, assign this texture to your material and set the Mapping to Spherical. Download the minified version here, put it on the BJS/js/ folder and called it in the <head> tag. You also have to write touch-action="none" in the <canvas>tag. Et voilà, you have touch support. Of course, check the sources downloadable at the beginning of the tutorial. Feel free to use BJS forum thread so as to make feedbacks. 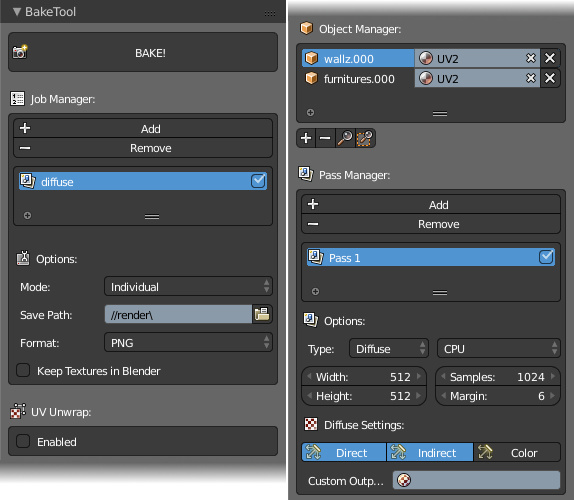 default Blender baking workflow isn't convenient, so I bought Baketool, which I used here. Note that some free addOns could be useful (haven't test all of them, suggest me some if you want): TexTools, BRM-BakeUI, Principled-Baker. Gimp 2.10. I prefer Photoshop but I don't have a personnal licence, so why not trying Gimp for this tutorial :).Krita is great too. Cet article va prendre le prétexte d'une toute petite scène pour présenter un workflow simple de Blender vers BabylonJS, comprenant la gestion des lightmaps, afin de tendre vers un éclairage réaliste. 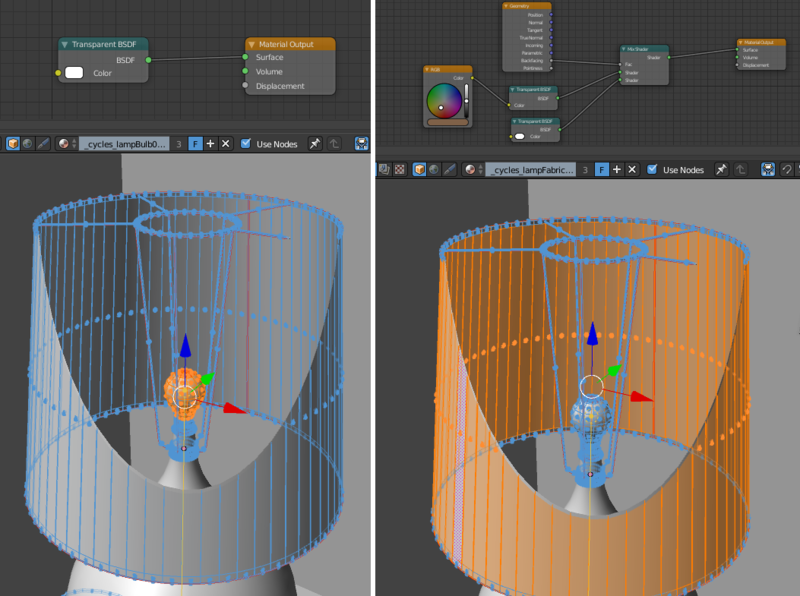 Les non-utilisateurs de Blender resteront peut-être intéressés par ce tutorial, puisque les grandes lignes de modélisation, unwrapping et gestion de la scène et ses objets restent les mêmes peu importe le logiciel, et aussi bien entendu la partie BabylonJS (BJS de son petit nom) qui est totalement indépendante du modeler utilisé. Il est bien sur conseillé d'avoir regardé et testé les Babylon 101 et les How to... de BabylonJS. Pour cet exemple je ne suis pas en workflow PBR mais Standard. Ceci vient du fait que l'exporteur officiel Blender-vers-BJS ne gère pas encore la conversion en PBR des matériaux. Il est aussi encore utile de savoir se débrouiller avec le Standard Workflow si l'on vise des machines utilisateurs peu puissantes (tout le monde n'a pas le dernier smartphone à la mode). Il est cependant possible de travailler en PBR en exportant au format glTF, ce workflow est encore en phase expérimentale et soumis à quelques bugs, mais il fera l'objet d'une suite à ce tuto. Les développeurs de BabylonJS nous proposent un éditeur, mais il possède des limitations qui ne me conviennent pas au quotidien, en particuler le fait que si je fais un nouvel export de ma scène Blender, il me faut recommencer tous mes réglages côté éditeur. Pourquoi pas lorsqu'il s'agit de jouer sur une micro-scène en one-shot, mais en production classique avec des exports & réexports permanents, ça n'est pas utilisable en l'état. Éditeur à surveiller tout de même, puisque souvent mis à jour. On est en temps réel, donc évidemment les objets doivent avoir un nom explicite, tachez de faire attention à ça, c'est important pour la suite lorsqu'on s'amusera avec du code. Les objets sont séparés en calques pour rendre plus fluide nos opérations. Rien d'exceptionnel ici. Pensez juste à préparer vos seams et sharp edges quand un mesh est terminé, pas besoin de s'y replonger après coup. Ne pas perdre du temps à soigner les UV2 pour le moment, il s'agit juste de vérifier que le dépliage automatique se comporte bien (Unwrapping ou SmartUnwrap). Les UV1 peuvent être définitifs. notez que si l'on souhaite être absolument rigoureux sur la répartition de surface des lightmaps, on peut s'embêter à calculer les texels afin de conserver une harmonie entre tous les différents objets et la résolution de leur lightmap, mais pour cette scène je me le fais au feeling. Il serait aussi possible de laisser détachés les objets et donc d'avoir des UV2 partagés, mais le workflow se compliquerait aussi bien du côté Blender que du côté Babylon. on peut remarquer qu'il reste un peu de vide : des plugins Blender aideraient à mieux répartir tout ça, mais dans une contrainte de rapidité de prod' en milieu pro', il n'est pas toujours évident d'atteindre la perfection. Ici le déplié reste satisfaisant. À ce stade, il est déjà possible de faire un premier export vers BabylonJS, même si nos lightmaps n'existent toujours pas. Vous pouvez déjà lire la doc' officielle à propos de l'exporteur (j'en ai écrit une partie, n'hésitez pas à me faire des retours et suggestions). Si vous n'avez encore de setups BabylonJS sous la main, n'oubliez pas l'existence de l'éditeur, ou même de la sandbox, qui vous permettront de regarder votre 3D sous tous les angles en deux temps, trois mouvements. L'export en lui-même n'est vraiment pas compliqué. Comme vous l'avez vu dans la doc' officielle, les réglages se situent dans les propriétés des meshes directement (ou du world, ou du material, etc). à repérer d'éventuels bugs et à les corriger avant de commencer à jongler entre les scènes. Lorsque notre scène temps réel est prête, il est temps de s'occuper de notre ambiance lumineuse. Il va être question ici de se concentrer sur l'éclairage et non sur le peaufinage des matériaux. En fait, nous allons même écraser la plupart des matériaux en les remplaçant par un seul tout simple et tout basique. La première action à affectuer dans notre nouvelle scène Cycles vide est évidemment d'importer nos objets dedans. pour les curieux, la piste la plus solide serait de lier les matériaux Cycles au niveau de l'objet plutôt que de ses data (ou vice-versa), mais mon plugin BakeTool n'a pas l'air d'apprécier. Dans le cas où vous mettez à jour la scène Cycles, vous aurez déjà présentes les anciennes version d'objets. Avant d'importer les nouvelles versions, supprimez les anciennes et n'oubliez pas de supprimer les Orphan Data via l'Outliner. Puisqu'au baking seul l'impact lumineux nous intéresse, il n'est pas vraiment utile de se coltiner une conversion de tous nos matériaux Blender Render vers Cycles. Sur une petite scène comme ça, cela reste envisageable mais sur une scène avec plus d'une centaine de matériaux y'a de quoi s'arracher les cheveux - surtout s'il nous faut faire une mise à jour de toute la géométrie deux jours plus tard. Afin d'éviter de le perdre lors d'un éventuel Orphan Data clean, on le met en Fake User. Oui mais, et le color bleeding ? En effet on le perd totalement avec cette technique. On peut alors sélectionner les éléments d'importance et créer des matériaux particuliers. Dans ma scène, j'ai choisi de conserver mon parquet ; mais là encore le matériau est tres simple puisqu'il s'agit tout simplement de la diffuse connectée au shader Diffuse BSDF. En revanche, en ayant placé la light à son emplacement logique (à savoir au milieu de l'ampoule), nous nous confrontons à un problème évident : la lumière ne passe pas à travers l'ampoule et l'abat-jour. Pour réduire le bruit au rendu , se référer à la doc' Blender officielle. On a maintenant un éclairage qui ressemble à quelque chose, on va pouvoir passer au baking des lightmaps. Ici j'utilise Baketool, qui n'est pas très compliqué à prendre en main. Si vous souhaitez utiliser le workflow par défaut, voir la doc' Blender officielle. Préparez votre liste d'objets et bakez sur leur second canal UV. Le point important ici est de sélectionner la passe de Diffuse sans sa Color. En effet, nous ne désiront que l'impact lumineux direct et indirect. Enregistrez vos lightmaps finales dans votre dossier BJS/assets/lightmaps/. Comme vu plus haut, il vous est possible de ne pas vous prendre la tête avec du code en utilisant l'éditeur officiel. Soyez juste certain de ne pas avoir à mettre à jour votre fichier exporté. Notez aussi qu'il vous faut avoir accès à un serveur web. Vous trouverez un peu d'aide sur cette page. Préférez afficher votre scène en mode navigation privée, pour éviter les problèmes de cache, et sachez qu'avoir la console ouverte est quand même très utile (en allant dans les settings de celle-ci, vous pouvez forcer la non-mise en cache). Vous pouvez déjà exporter le fichier babylon dans le dossier assets, les textures nécessaires y seront copiées automatiquement. Placez dans le dossier dédié les lightmaps. L'index.html est l'endroit où tout va se passer. Commencez par créer un fichier texte vide nommé ainsi, puis éditez-le. Dans les balises <head> rien de particulier : on indique le chemin du moteur, et on informe le navigateur que l'on souhaite que la partie 3D (canvas) remplisse toute notre page. Nous voici donc avec notre premier chargement de scène ! Avant de s'attaquer aux réglages matériaux, il nous reste à gérer les lightmaps et à les assigner de façon automatique à nos objets. On va donc faire nos bouts de code dans cette fonction. 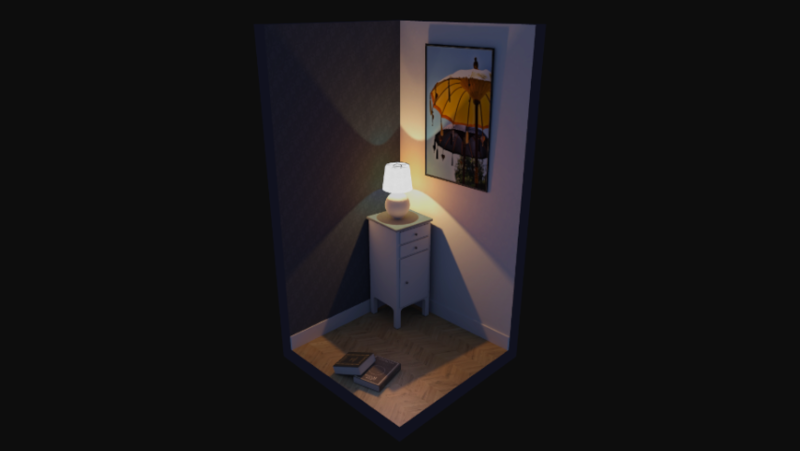 Mais avant le SceneLoader, j'ai besoin d'une fonction d'assignation de la lightmap à un material, qui sera appelée ici assignLightmapOnMaterial. Si vous souhaitez faire usage du copier-coller sans analyse, ne vous concentrez que sur cette partie : var lightmappedMeshes = ["wallz.000", "furnitures.000"]; où il vous faut renseigner le nom de vos meshes à lightmapper. Bon alors on se rend vite compte ici qu'il manque un réglage sur notre rendu. Quand on a activé le paramètre useLightmapAsShadowmap dans nos matériaux lightmappés, on a l'ambientColor de la scene qui agit en multiply. Ainsi, si cette couleur est grise, la plus haute valeur d'ambient de nos matériaux, même si celle-ci est blanche, sera grise aussi (clampée par la scene.ambientColor). Tout comme les matériaux, le plus vous préréglez dans Blender, le plus simple c'est. Pour des réglages plus avancés, vous devriez comprendre comment faire une fois la partie sur les réglages matériaux effectuée. Pour connaitre tous les paramètres qui nous sont accessibles, comme d'hab'... il faut regarder la doc'. N'oubliez pas que le plus simple est d'utiliser les paramètres accessibles directement via Blender. Mettons qu'il nous tienne à coeur de passer notre mur blanc en rose. Il nous suffit d'aller dans l'onglet Material, de trouver notre matériau (utiliser le Filter by name...), de trouver notre ambientColor et de la régler. Vous rechargez alors votre page pour vérifier que ça soit bien pris en compte... et là c'est le drame : évidemment, notre réglage s'est perdu en route. Et hop ! on est bon. 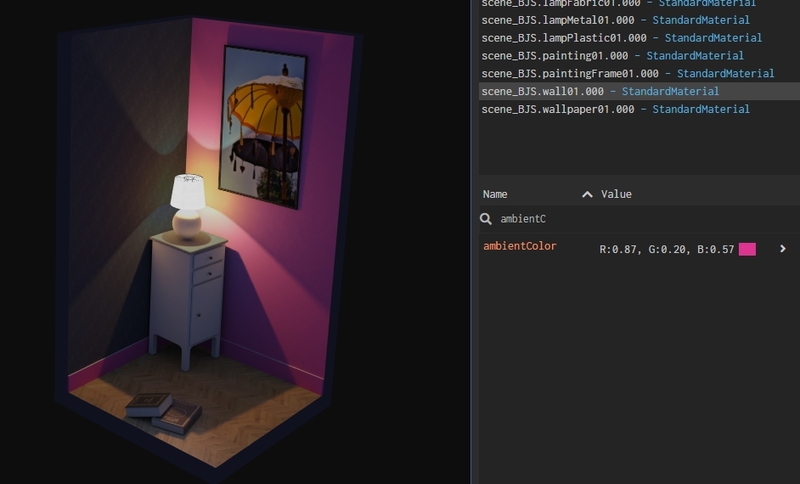 Alors vous me direz "Oui mais l'ambientColor on peut la régler sans s'emmerder directement dans Blender non ? ", et vous aurez raison, c'était juste pour avoir un paramètre visuel pour le tuto. La démarche est juste identique pour n'importe quel paramètre, ici en consultant l'API sur l'ambientColor j'ai pu voir que BJS me demandait de lui fournir une Color3, dont acte. 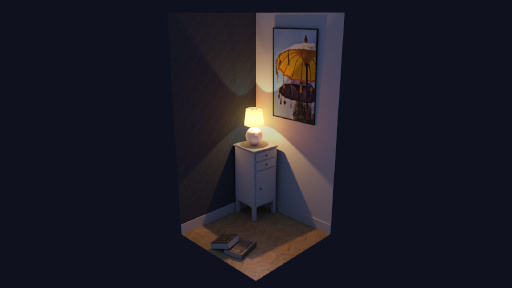 Imaginons que je veuille supprimer une lightmap sur un matériau d'un de mes objets lightmappé ? Mes normalMaps ont été générées en norme DirectX et non OpenGL ? Puis dans Blender, assignez votre texture sur votre matériau et passez le Mapping en Spherical. Téléchargez la version minifiée ici, placez-là dans le dossier BJS/js/ puis appelez-là dans la balise <head>. Et voilà, vous avez le support du tactile. Bien entendu, jettez un oeil sur les sources fournies en début de tutoriel. le workflow du texture baking de base de Blender est tout pourri, c'est pourquoi je me suis acheté l'addOn Baketool, que j'ai utilisé ici. Notez qu'il est possible que les addOns gratuits suivants peuvent vous être utiles (je ne les aient pas tous essayés, n'hésitez pas à m'en suggérer d'autres) : TexTools, BRM-BakeUI, Principled-Baker. Gimp 2.10. Je trouve Photoshop bien plus pratique, mais je n'ai pas de licence personnelle. Donc pourquoi ne pas profiter de l'écriture de ce tuto' pour tenter de mieux le maitriser. Krita vaut son test aussi.